The genus Rattus refers to a specific genus of muroid rodents, all typically called rats. However, the term rat can also be applied to species outside of this genus. The best-known Rattus species are the black rat (R. rattus) and the brown rat (R. norvegicus). 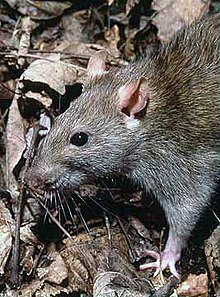 The group is generally known as the Old World rats or true rats and originated in Asia. Rats are bigger than most Old World mice, which are their relatives, but seldom weigh over 500 grams (1.1 lb) in the wild. The genus Rattus is a member of the giant subfamily Murinae. Several other murine genera are sometimes considered part of Rattus: Lenothrix, Anonymomys, Sundamys, Kadarsanomys, Diplothrix, Margaretamys, Lenomys, Komodomys, Palawanomys, Bunomys, Nesoromys, Stenomys, Taeromys, Paruromys, Abditomys, Tryphomys, Limnomys, Tarsomys, Bullimus, Apomys, Millardia, Srilankamys, Niviventer, Maxomys, Leopoldamys, Berylmys, Mastomys, Myomys, Praomys, Hylomyscus, Heimyscus, Stochomys, Dephomys and Aethomys. The genus Rattus proper contains 64 extant species. A subgeneric breakdown of the species has been proposed, but does not include all species. The following phylogeny of selected Rattus species is from Pagès, et al. (2010). ^ Pagès, Marie; Chaval, Yannick; Herbreteau, Vincent; Waengsothorn, Surachit; Cosson, Jean-François; Hugot, Jean-Pierre; Morand, Serge; Michaux, Johan (2010). "Revisiting the taxonomy of the Rattini tribe: a phylogeny-based delimitation of species boundaries". BMC Evolutionary Biology. 10: 184. doi:10.1186/1471-2148-10-184. Archived from the original on 2017-07-10. This page was last edited on 13 January 2019, at 00:45 (UTC).